Sinister5 have announced a revamped CS:GO lineup to compete in Leg 3 of the VS Masters division and ESEA Open Season 28. It’s a team with a particularly strong blend of youth and experience, even if the majority of the players are still relatively early in their respective careers. Taking the reins of the team is legendary in game leader, James “zerOch4Nce” Wijnberg. Back in Black. Well, green anyway. A veteran of a number of top-flight teams on the local scene, zerOch4Nce has a solid track record of building highly competitive teams. Often with newer or less experienced players. After retiring as a player in late 2017 and then a stint as coach of Big 5 Esports, he’s back to do it all over again. I managed to tear him away from his other big responsibility, managing his fruit tree farm, to chat about his new adventure. axtremes: You retired and moved to coaching after leaving Flipside3 Tactics post-ESL Africa Season 2. That wasn’t all that long ago. What changed for you? zerOch4Nce: I coached for four or five months but struggled to connect properly with the people I worked with. During this period, I felt like there was a gap in the scene for a certain bunch of players that were willing to really push the limits. Where there any differences in philosophy between yourself and the Big 5 leadership? In terms of interpersonal skills, there was definitely a difference in opinion between myself and B5 leadership. It was difficult to really access and address that as the scene has been pretty quiet. I think motivation to push the limits generally is at an all time low throughout the community. Onto the new team. Sinister5 are vying for a spot in Masters for the next leg of VS. Are you helping them prepare for their final game before the end of this leg to make sure they make it through? The team will be competing in Masters. I’m not helping them for the last few games as I am focusing on the new team structures. You’ve worked with some of these players before in Flipsid3 Tactics. Did that make the prospect of working with them again attractive? I’ve worked with dada, HackeM, and dyvo before. I think coming into this, my goal was to make sure the chemistry between players was good and the ideology was the same. My past experiences in teams has been full of internal conflict between one or two people, as personalities clashed at certain times making progress near impossible. I want to build the same family atmosphere that I had in Energy back in 2014 that lead us to all that success. That requires a certain type of person to commit to something like that. Are we going to see the vintage ZerOch4Nce tactical approach or a more loose playstyle from this team? I hope that you will see both a vintage style but also a more natural style that allows us to play different types of Counter-Strike on demand. Being dynamic is crucial to getting to the top. How do you think the team will fare in the rest of the season? We have set pretty demanding goals for ourselves, but I have no doubts about the potential and talent in the team. It’s completely up to us on how well we do with regards to our work ethic and team mentality. Speaking of goals, what are yours for Snister5 in 2018? In my opinion this team should be consistently top 3 in 2018 if all goes to plan. Any shoutouts or people you’d like to acknowledge? Shout out to Hadlee and Toolz at Big5 for trying to accommodate me as much as possible and understanding my path forward. I’d also like to thank Sinister5 for going out of their way to help make this project a reality. Lastly thanks to all the fans and support we have gotten from the community. Thanks for chatting to us James! So ax, what do you think? I hate making predictions based on very little available data. 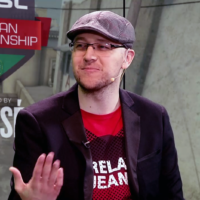 However, I am very confident in zerOch4Nce’s ability to get the best out of the players he has available. He has a real heavy-hitter in HackeM and plenty of untapped potential in the other three. They’ll be more tactical and better prepared than they ever were in the past. Sinister5 could be very good, even without MisteM hard-carrying them as was the case last season. Top five is a real possibility for them, although in true zerOch4Nce fashion he’s setting his sights higher than that. Here’s an example of what zerOch4Nce can do as an individual player to whet your appetite: https://youtu.be/r4toRt6UPFM. If you want to know more about James, here is a career retrospective interview I did with him last year: https://youtu.be/0CkeFMksGZk.